Mike Treen: Stand up to Islamophobia – time to tell Trump-like demagogues to get lost! 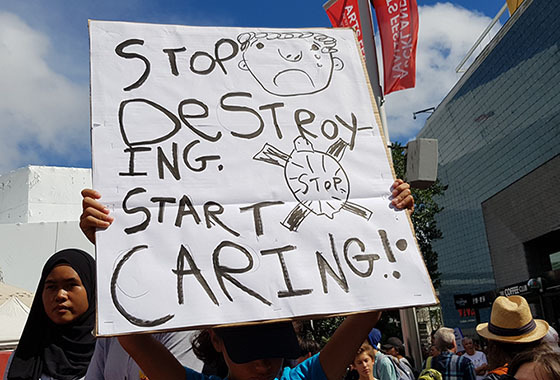 After a beautiful day in which thousands of young people across Aotearoa marched for a better future, a chill has descended across this country. Far-right murderers have shot innocent Muslims in their holy mosques and livestreamed it on Facebook and 4Chan. The true face of fascism is revealed once again. This is what happens when you believe the lies that they merely want “free speech” to advocate their genocidal ideology. They hate people of different ethnicities so much that they are prepared to commit terrorist crimes. Now more than ever, we must stand up in our millions as the true people of Aotearoa, and fight racism, fascism and Islamophobia in all forms. This is the inevitable consequence of politicians using rhetoric bashing migrants in order to gain support and votes. Don Brash and other opportunists from ACT and the New Conservatives have helped enable the rise of a small but militant far-right movement with their dog-whistle scapegoating. It’s time to tell these Trump-like demagogues to get lost. The crisis of inequality, housing, and low wages has been caused by corporate greed and government failure — don’t listen to the lies from NZ First, National, and, even Labour, about migrants being to blame for the suffering of the people of this land. What is the point of the intelligence community in Aotearoa, when for decades it can spy on peaceful activists such as John Minto, Keith Locke and me, but it can’t respond to the threat of genuinely violent thugs such as today’s racist murderers, who boasted on their forums just last night that they were going to kill Muslims? The GCSB is a disgraceful failure. We are right to feel horrified, we are right to feel sick, and we are right to feel angry — but we should not forget the optimism we felt this morning when marching alongside the School Strike for Climate Action. Those marches in so many cities today showed the very real case for hope — an entire generation is ready to fight for a better future, and they will be just as ready to fight against racism as well. Those few Nazi thugs do not represent Aotearoa in any way, shape or form. Love Aotearoa Hate Racism is holding an emergency hui at 7pm tonight to organise how we respond to these atrocities, and build a mass movement against fascism in the long term. The meeting will be held at Unite Union Auckland office, 6a Western Springs Road, Morningside. Please let us know if you are willing to fight — whether you are in Auckland, or if you want to get the fight against racism started in your city. Students at today’s Aotea Square rally in Auckland kicking off the global Strike 4 Climate action day. A landmark ruling by an Australian court is expected to have international consequences for newsrooms, with media companies on notice they face large compensation claims if they fail to take care of journalists who regularly cover traumatic events. The Victorian County Court accepted the potential for psychological damage on those whose work requires them to report on traumatic events, including violent crimes. The court ruled on February 22 that an Age journalist be awarded A$180,000 for psychological injury suffered during the decade she worked at the Melbourne-based newspaper, from 2003 to 2013. The journalist, known in court as “YZ” to protect her identity, reported on 32 murders and many more cases as a court reporter. She covered Melbourne’s “gangland wars”, was threatened by one of its notorious figures, and found it increasingly difficult to report on events involving the death of children, such as the case of four-year-old Darcey Freeman who was thrown by her father from West Gate Bridge in 2009. After complaining that she was “done” with “death and destruction”, the journalist was transferred to the sports desk. But a senior editor later persuaded her, against her wishes, to cover the Supreme Court where she was exposed to detailed, graphic accounts of horrific crimes, including the trials of Donna Fitchett, Robert Farquharson and Darcey Freeman’s father. The repeated exposure to traumatic events had a serious impact on her mental health. YZ took a voluntary redundancy from the newspaper in 2013.
transferred her to court reporting after she had complained of being unable to cope with trauma experienced from previous crime reporting. The Age contested whether the journalist was actually suffering from post-traumatic stress. It argued that even if a peer-support programme had been in place it would not have made a material difference to the journalist’s experience. Further, The Age denied it knew or should have known there was a foreseeable risk of psychological injury to its journalists and simultaneously argued that the plaintiff knew “by reason of her work she was at high risk of foreseeable injury”. Judge Chris O’Neill found the journalist’s evidence more compelling than the media company’s, even though the psychological injury she had suffered put her at a disadvantage when being cross-examined in court. This is a historic judgment – the first time in the world, to my knowledge, that a news organisation has been found liable for a reporter’s occupational PTSD. This is not the first time a journalist has sued over occupational PTSD, as Shapiro calls it, but it is the first time one has succeeded. In 2012, another Australian journalist unsuccessfully sued the same newspaper. In that earlier case, discussed by a co-author of this article (Ricketson) in Australian Journalism Review, the judge was reluctant to accept either the psychological impact on journalists covering traumatic events or The Age’s tardiness in implementing a trauma-aware newsroom. In stark contrast, the judge in the YZ case readily accepted both these key concepts. Historically, the idea of journalists suing their employers for occupational PTSD was unheard of. Newsroom culture dictated that journalists did whatever was asked of them, including intrusions on grieving relatives, or “death knocks” as they are known. Doing these was intrinsic to the so-called “school of hard knocks”. Cadet journalists were blooded in the newsroom by their ability to do these tasks. The academic literature shows that newsroom culture has been a key contributor to the problem of journalists feeling unable to express concerns about covering traumatic events for fear of appearing weak and unsuited to the job. What is alarming from the evidence provided to Judge O’Neill is the extent to which these attitudes still hold sway in contemporary newsrooms. YZ said that as a crime reporter she worked in a “blokey environment” where the implicit message was “toughen up, princess”. The YZ case shows The Age had learnt little about its duty of care to journalists from the earlier case it defended. One of its own witnesses, the editorial training manager, gave evidence of his frustration at being unable to persuade management to implement a suitable training and support programme. Judge O’Neill found him a compelling witness. The Dart Center has a range of tip sheets on its website for self-care and peer support. What is clear from this case is that it’s not just about individual journalists and what they do, but about editors and media executive taking action. One media organisation that is leading the way is the ABC. The national broadcaster has had a peer-support programme in place for a decade. Such programmes are vital, not just for individual journalists, but for democracy and civil society. This is because whatever changes have been sweeping through the news media, there is no change in the incidence of disasters, crimes and traumatic events that need to be covered. News workers need help. And they are beginning to demand it. Dr Matthew Ricketson is professor of communication at Deakin University . He is also chair of the board of directors of the Dart Centre Asia-Pacific, which is affiliated with the Dart Center for Journalism and Trauma based in the United States. It is a voluntary position. During part of the period covered by the YZ court case he worked as a journalist at The Age. Dr Alexandra Wake is journalism programme manager at RMIT University. She is also on the Dart Centre Asia Pacific board, and in 2011 was named a Dart Academic Fellow. As part of that process, Alex traveled to Columbia University in New York for training, at Dart’s expense. This article is republished from The Conversation under a Creative Commons licence. In 2016, the Pacific Media Centre responded to the devastation and tragedy wrought in Fiji by Severe Tropical Cyclone Winston by initiating the Bearing Witness journalism project and dispatching two postgraduate students to Viti Levu to document and report on the impact of climate change (Robie & Chand, 2017). This was followed up in 2017 in a second phase of what was hoped would become a five-year mission and expanded in future years to include other parts of the Asia-Pacific region. This project is timely, given the new 10-year Strategic Plan 2017-2026 launched by the Secretariat of the Pacific Regional Environment Programme (SPREP) in March and the co-hosting by Fiji of the UN Framework Convention on Climate Change (COP23) climate change conference in Bonn, Germany, during November. The students dispatched in 2017 on the ‘bearing witness’ journalism experiential assignment to work in collaboration with the Pacific Centre for the Environment and Sustainable Development (PaCE-SD) and the Regional Journalism Programme at the University of the South Pacific included a report about the relocation of a remote inland village of Tukuraki. They won the 2017 media and trauma prize of the Asia-Pacific Dart Centre, an agency affiliated with the Columbia School of Journalism. This article is a case study assessing the progress with this second year of the journalism project and exploring the strategic initiatives under way for more nuanced and constructive Asia-Pacific media storytelling in response to climate change. Heading on the book chapter on University of the South Pacific’s 50-year history. The Univerasity of the South Pacific’s 50th anniversary marks 30 years of existence for its regional journalism programme. In an eventful journey, the programme weathered military coups, overcame financial hardships and shrugged off academic snobbery to get this far. The programme started in Suva in 1988, with Com- monwealth funding, and a handful of students to its name. It has produced over 200 graduates serving the Pacific and beyond in various media and communication roles. USP journalism graduates have produced award-winning journalism, started their own media companies and localised various positions at regional organisations once reserved for expatriates. See also Robie, D. (2004). Mekim Nius: South Pacific media, politics and education. Suva: University of the South Pacific Book Centre. The Pacific Media Centre (PMC) became the only university-based communications and media publishing unit to be included in Radio New Zealand’s highly praised public outreach programme in recognition of its specialised Pacific knowledge, research and media content production. It was also the only NZ programme invited to join the Journalism Research and Education Association (JERAA) of Australia. Pacific journalism academic Professor David Robie believes the media play a critical role in exposing abuses of power in a world increasingly hostile towards journalists. However, journalists in the Pacific are frequently “persecuted by smallminded politicians with scant regard for the role of the media,” he says. Speaking at the 18th University of the South Pacific Journalism Student Awards ceremony at Laucala campus in Suva, Fiji, last October, Dr Robie said despite the growing global dangers surrounding the profession, journalism was critically important for democracy. Dr Robie said that while such “ghastly fates” for journalists – such as the extrajudicial killing of Saudi dissident writer Jamal Khashoggi in Turkey earlier that month – may seem remote in the Pacific, there were plenty of attacks on media freedom to contend with, while trolls in the region and state threats to internet freedom were “also rife”. IT IS necessary to understand that the conflict in Venezuela manifests a war between classes, not between factions of the one class, as in elections in “normal” bourgeois democracies.. The victor will not be inclined to give the other side a chance to come back into power “at the next election”. We cannot expect the Chavistas to play by “normal” bourgeois electoral rules while the other side tries coups, economic sabotage, actively supports a foreign state’s economic sanctions, takes tens of millions from a hostile foreign state, attempts presidential assassination, and kills pro govt activists, while also owning all the private media. Some expect the so-called liberal democratic rules of the game to be applied – but by one side only. And what will be the result if the Venezuelan Bolivarian movement plays to lose and is defeated. Just remember two names: Pinochet and Suharto. All out class war for a state based one class or the other has usually been resolved militarily, through a revolutionary war (Russia, China, Vietnam, Cuba) or counter-revolutionary violence (Indonesia, Chile). Uniquely, in the case of Venezuela, neither war nor a counter-revolution has yet occurred, even 20 years on. My guess is that the Chavistas are constrained to show restraint towards the capitalist class, avoiding escalation to a military confrontation, because of one main factor: the threat of military destruction. Libya showed that the US was willing to see a country go to hell as long as oil could still flow. 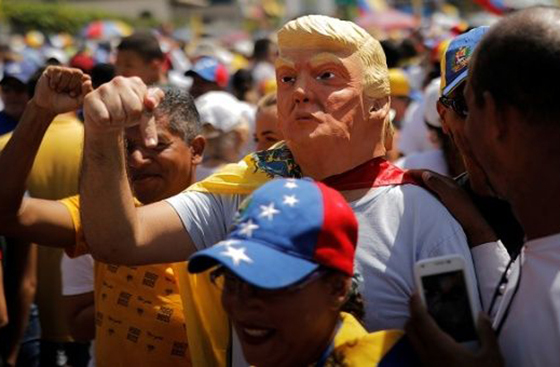 The US is now threatening military intervention – but to militarise a class war in Venezuela will run the risk of it spreading beyond national borders. Besides this constraint, the Venezuealan Bolivarians have been constrained by the objective limits of a 3rd world economy – and a 3rd world economy under siege and with no Soviet Union to protect or aid it, only valiant and principled little Cuba. When Chavez became President in 1998, the GDP had already fallen back to 1963 levels. Corruption, including in the oil sector, was endemic. Immediately on Chavez’s election US and local capitalist economic sabotage began. Underpinning this is the reality of a 3rd world economy in an imperialist world economy. The achievements of the Chavez government in improving economic conditions in these circumstances between 1998 and when oil prices started to fall in 2013 was extremely impressive. Declining oil prices in a country 90 percent dependent on oil for foreign exchange hit the economy hard, all worsened by ongoing economic sabotage from within and without. From August 2017, the sabotage became even more savage with intensified US economic sanctions. The Chavista government, like the governments of all 3rd world countries, most of whom are still pro-capitalist, did not have the financial capacity (capital) or access to technology (monopolised by imperialist countries) to embark on any significant program of diversified industrialisation. This has not occurred anywhere by a medium sized poor country, let alone by an anti-capitalist government under siege, still consolidating itself. The 2018 presidential elections showed the current government had the active support of 6 million Venezuelans, mostly from among the poor. The demonstrations over the last few days shows that this 6 million will still struggle, struggle to win more to their side. More elections may figure in the evolution of this struggle, but we should all note that any such new election processes, should they occur, will be part of a struggle where one side, since the beginning, from at least 2002, has resorted to coups, economic sabotage, political collaboration with a hostile foreign power (much deeper than anything D. Trump may have been involved in), among other “non rules of the game” practices. Only recognise the Maduro government! Demand the end of economic sanctions against the Venezuealan people and state! No to any US military intervention! Geraldine Lopdell’s family was looking for a fitting way to celebrate a “life well lived” when they decided to set up one of AUT’s newest awards. During life, Geraldine had been an excellent teacher and artist, a supportive and generous friend and a captivating storyteller with an adventurous spirit. Her early years were spent in Tonga and Samoa where her family travelled for her father’s work, and she had a firm belief that more women’s stories and views – particularly those of Pasifika women – needed to be told and heard. The Geraldine Lopdell Award for Diversity in Communication will encourage Pasifika women to tell their stories. The first prize will be given in April 2019, nearly one year after Geraldine’s passing. It will be set at $1,200, and is anticipated to be offered annually for an initial term of ten years. Deciding a memorial award to support something she cared about would be a fitting way to celebrate her life, Geraldine’s partner Colin and her two daughters Alex and Anne had approached their family friend, AUT’s Professor David Robie and have since been working with the AUT Foundation to establish the award. Professor Robie, who heads up AUT’s Pacific Media Centre – Te Amokura, suggested a prize be established alongside the existing Storyboard Award for Diversity Reporting. It was decided the Pacific Media Centre, with its focus on telling ignored and ‘untold’ stories, and amplifying Pasifika women’s voices, was a natural fit for an award to celebrate this special woman’s legacy. The family believe that Geraldine would have been honoured to have this award established in her name as she would have wanted to value the contributions and perspectives of Pasifika women. As Colin says: “The award is about recognising the life of an extraordinary and wonderful woman by encouraging an extraordinary and wonderful woman at the start of her career. She would have liked her legacy to support the next generation. Stand by for news of the first recipient of the Geraldine Lopdell Memorial Award for Excellence in Communication – and undoubtedly, a few great stories from the recipient. Robie, David (2019, January 25). Typhoon Usman and nightmarish holiday times in Bicol. Asia Pacific Report. Robie, David (2018). Killing the messenger [Editorial]. Pacific Journalism Review : Te Koakoa, 24(2), 6-11. Robie, David (2018). Journalism under duress in Asia-Pacific: A decade of resistance: The Pacific Media Centre, Pacific Media Watch, impunity and human rights. Pacific Journalism Review : Te Koakoa, 24(2), 12-32. Frain, Sylvia (2018). ‘Make America Secure’: Media, militarism and climate change in the Marianas Archipelago. Pacific Journalism Review : Te Koakoa, 24(2), 218-240. Robie, David (2018). A crusade for media truth and justice [Review]. Pacific Journalism Review : Te Koakoa, 24(2), 258-262. Robie, David (2018). Indonesian repression and betrayal in West Papua [Review]. Pacific Journalism Review : Te Koakoa, 24(2), 266-271. Robie, David (2018). IKAT on the right track [Editorial foreword]. IKAT: The Indonesian Journal of Southeast Asian Studies, 1(2), v-viii. Robie, David; Rahman, Khairiah; and Cass, Philip; (eds.). (2018, November). Journalism Under Duress in Asia-Pacific. Pacific Journalism Review : Te Koakoa, 23(2). 278pp. Robie, David; Rahman, Khairiah; Cass, Philip; Wahyuni, Hermin Indah; and Yulianto, Vissia Ita (eds). (2018, July). Disasters, Cyclones & Communication: Connecting the dots in Asia-Pacific. Pacific Journalism Review : Te Koakoa, 24(1). 249pp. Robie, David; and Marbrook, Jim (2018). Bearing Witness 2018: A climate change journalism/documentary development project. DevNet 2018: Disruption and Renewal conference. Robie, David (2018). Kele’a, va, kororonga, talanoa and tapoetethakot: Expanding millennial notions of ‘Pacific way’ journalism education and media research culture. 26th Asia Media Information and Communication (AMIC) Centre Conference, Manipal, South India. Tom, Blessen (2018, November 30). Media freedom in Pacific a growing challenge, says journalism academic. Asia Pacific Report [Online]. Robie, David (2018, November 8). Kanaky independence campaign rolls on … encouraged by ballot result. [Part 2]. Asia Pacific Report [Online]. Robie, David (2018, November 7). New Caledonia stirs painful memories – and a hopeful future [Part 2]. Asia Pacific Report [Online]. Nakhid, Camille (2018, September 15). Camille talks to TTT Live about ‘decolonising’ research. Trinidad and Tobago Television. Ellis, Gavin (2018, August 23). RNZ None to Noon tribute to Pacific Media Centre postgraduate students. [Commentary on Radio New Zealand]. Robie, David (2018, August 7). David Robie talks to Radio 531pi host Ma’a Brian Sagala about the legacy of the 1985 South Pacific Nuclear Free Zone Treaty. [Interview with Radio 531]. Marbrook, Jim (2018, May 18). Conflict, Custom and Conscience. Spasifik Magazine. Bell, Jean (2018, May 4). PMC director condemns ‘targeting’ of journalists and silence on West Papua. [Seminar by Dr David Robie]. Asia Pacific Report. Robie, David (2018, May 3). Free media week killings underscore crimes of impunity against journalists. Asia Pacific Report. Frain, Sylvia (2018, February 27). Climate change media tools helpful, but more Pacific indigenous perspectives needed. Pacific Media Centre Online. Robie, David (2018, February 25). More frontline research ‘by Pacific for Pacific’ plea at climate conference. Asia Pacific Report [Online]. Robie, David (2018, February 24). Juffa blasts PNG resources ‘sell out’ but tells of Managalas hope. Asia Pacific Report [Online]. Robie, David (2018, February 23). Underestimate climate change political upheaval ‘at peril’, warns former PM. Asia Pacific Report [Online]. Nakhid, C. (2017). The coping strategies and responses of African youth in New Zealand to their encounters with the police. Robie, David (2017). The insecurity legacy of the Rainbow Warrior affair: A human rights transition from nuclear to climate change refugees. Pacific Dynamics, 1(1), 133-152. Robie, David; and Nash, Philip (eds). (2017, November 30). Media education in Asia-Pacific. Pacific Journalism Review : Te Koakoa, 23(2). 230pp. Robie, David; Nash, Chris; and Singh, Shailendra (eds.). (2017, July 21). Climate change in Asia-Pacific. Pacific Journalism Review : Te Koakoa, 23(1). 284pp. Robie, David (2017). Asia Pacific Report: A radical non-profit journalism model for campus-based social justice media. Social Movements Resistance and Social Change III Conference, Victoria University of Wellington, September 2016. Pages 110-148. Published 30 August 2017. Frain, Sylvia C. (2017). Fanohge Famalåo’an & Fan’tachu Fama’lauan: Women Rising Indigenous Resistance to Militarization in the Marianas Archipelago. Unpublished doctoral thesis, National Centre for Peace and Conflict Studies, University of Otago). Robie, David (2017, November 15). Indonesia’s development dilemmas – a green info gap and budget pressure. Asia Pacific Report [Online]. Borrowdale, James (2017, July 22). Why Pacific and Maori communities are rising up for a free West Papua. Asia Pacific Report and VICE [Extensive interview with PMC’s David Robie). [Online]. Cherkaoui, Tarek (2017, July 11). Autocracy strikes back: Media freedom under siege in Arabia. Asia Pacific Report [Online]. Robie, David (2017, June 11). Flashback to NZ’s nuclear-free law 1987: Challenging Goliath. Asia Pacific Report/New Internationist. Hutt, Kendall (2017, May 31). Duterte’s ‘war on drugs’ killings spark row during NZ human rights seminar. Asia Pacific Report [Online]. Nakhid, Camille (2017, May 19). ‘I want my children back’ – Fighting for Australia’s indigenous children. Asia Pacific Report [Online]. Robie, David (2017, May 12). An Indonesian oasis of progressive creativity emerges in culture city. Asia Pacific Report [Online + video]. Robie, David (2017, May 7). Rave hospitality, but Indonesia fails West Papua with media freedom hypocrisy. Asia Pacific Report [Online]. Bryce, Brindi (2017, February 9). VANUATU: Media now in uncharted territory with FOI law now in place #9803. Asia Pacific Report. [Radio Australia Pacific Beat Interview with Prof David Robie by Bindi Bryce]. Bryce, Brindi (2017, February 9). Vanuatu media in unchartered territory as Freedom of Information law becomes a reality. ABC Pacific Beat. [Interview with Prof David Robie by Bindi Bryce]. Pacific Media Watch (2017, July 13). PNG court silences political blogger’s comments, blogger posts gag image. IFEX [Canada]. Pacific Media Watch (2017, July 13). PNG court silences political blogger’s comments, blogger posts gag image. Asia Pacific Report. Robie, David (2017, January 15). Endangered – the frontline journalism of outrage [Review]. Asia Pacific Report. Robie, David (2017, January 12). Florida airport shootings – few basic questions being asked. Asia Pacific Report. Pacific Media Watch Freedom Project (2017). Full year’s research and current affairs file. Pacific Media Centre. Robie, David (2016). ‘Unfree and unfair’? Media intimidation in Fiji’s 2014 election. In Lawson, Stephanie, and Ratuva, Steven (Eds. ), The People Have Spoken: The 2014 Elections in Fiji (pp. 83-107). Canberra: Australian National University. Cass, Philip, and Robie, David (2016). Journalism Education in the Pacific. Pacific Journalism Review, 22(2). (216 pages). Robie, David (2016, May). Endangered Journalists. Pacific Journalism Review, 22(1). (262 pages). Robie, David (2016). From Pacific Scoop to Asia-Pacific Report: A case study in an independent campus-industry media partnership. Pacific Journalism Review, 22(2), 64-86. Robie, David (2016). La’o Hamutuk and Timor-Leste’s development challenges: A case study in human rights and collaborative journalism. Media Asia, 42(3-4), 209-224. Robie, David (2016). Tanah Papua, Asia-Pacific news blind spots and citizen media: From the ‘Act of Free Choice’ betrayal to a social media revolution. 51st Foreign Policy School: Global Polics from State to Social Media, Conference proceedings. Robie, David (2016). Frontline 2: Rainbow Warrior, secrecy and state terrorism: A Pacific journalism case study. Pacific Journalism Review, 22(1), 187-213. Alzowaimil, Majid A. (2016). After the Arab Spring: An analysis of the future of journalism in the Middle East. AUT Master of Communication Studies thesis. Abplanalp, Karen (2016). Media restrictions on Papua – understanding the restrictions. AUT Master of Communication Studies exegesis and microsite. Robie, David (2016, September 1-3). From Un Tavur to Asia Pacific Report: Case studies in campus-based social justice media. Counter Futures Conference, “Social Movements, Resistance and Social Change”, Victoria University, Wellington. Robie, David (2016, July 2). Tanah Papua, Asia Pacific news blind spots and citizen media. Otago Foreign Policy School, Otago University, Dunedion, 1-3 July 2016. Robie, David (2016, April 17). Pacific human rights as a ‘mindful’ journalist. [Extracted from keynote address by Dr Robie].”Enhancing a Human rights-based approach to news reporting” Forum in Nadi, Fiji, 13-15 April 2016. Robie, David (2016, December 3). Carry on Fidel Castro’s global legacy, urges Cuban ambassador. Asia Pacific Report. Robie, David (2016, September 19). Philippines ‘hit man’ allegations spur renewed calls for killings probe. Asia Pacific Report. Robie, David (2016, September 3). Rendezvous with the ‘no nukes’ Aneityum cover girl after 33 years. Vanuatu Daily Post. Camille Nakhid (2016, July 30). A Wiradjuri grandmother’s sad story: ‘The Stolen Generations have never stopped’. Asia Pacific Report. Camille Nakhid (2016, July 22). Still stealing the generations – the abduction of Indigenous Australian children still goes on. Asia Pacific Report. David Robie (2016, July 6). Interviewed by 95bFM’s Andrew Winstanley on the university student unrest in PNG. 95bFM, University of Auckland. David Robie (2016, May 26). Pacific corruption-fighters worried as online database faces uncertain future. [Interview with Jemima Garrett]. Radio Australia Pacific Beat. David Robie (2016, April 28). ‘Pacific media ought to bear witness to human rights violations’ – David Robie. Triple RRRT Project of the United Nations Development Programme, Nadi, Fiji. David Robie (2016, April 26). PMC director calls for ‘voice for the voiceless’ at Pacific human rights forum. AUT News. David Robie (2016, April 21). Fear of reprisal puts limit on Pacific human rights journalism, say advocates. Asia Pacific Report. David Robie (2016, April 21). Fear of reprisal limiting human rights journalism [ Interview with Ben Robinson]. RNZI Dateline Pacific, Wellington. David Robie (2016, April 19). Tell the truth, journos told [Interview with Margaret Wise]. The Fiji Times, Suva. David Robie (2016, April 14). Workshop for journos. The Fiji Times, Suva. David Robie (2016, April 14). Media have big future. Fiji Sun, Suva. David Robie, (2016, April 13). Focus on journos. The Fiji Times, Suva. David Robie (2016, April 9). Polar bear mojo for Rainbow Warrior skipper’s environmental thriller [Review of Greenpeace Captain]. Asia Pacific Report. Alastair Wanklyn (2016, April 6). Panama Papers: China censors allegations, but Russian media notes contents. [Interview with David Robie]. Asia Pacific Report. Alastair Wanklyn (2016, April 5). China, squelches Panama allegations, but Russia media note contents [Interview with David Robie]. The Japan Times. Frain, Sylvia C. (2016, March 3). Mariana Islands community groups to sue US Navy over at risk wildlife. Asia Pacific Report. David Robie (2016, February 17). Mystery of the 1983 Vanuatu ‘nuclear free’ girl finally solved. Cafe Pacific. Robie, David (2015, June): Don’t Spoil My Beautiful Face: Media, Mayhem and Human Rights in the Pacific [2nd edition]. Auckland: Little Island Press in association with the Pacific Media Centre. Robie, David (2015, July): Eyes of Fire: The Last Voyage of the Rainbow Warrior [5th Edition]. Auckland: Little Island Press. Robie, David (2015). Unfree and unfair? Media intimidation in Fiji’s 2014 election. In Ratuva, Steve, and Lawson, Stephanie, Fiji’s 2014 General Election. Canberra: Australian National University (In production). Robie, David; King, Barry; Cass, Philip, and Bacon, Wendy (2015, May). Political Journalism in the Asia-Pacific [Book edition]. Pacific Journalism Review, 21(1): 262 pages. King, Barry, Goldson, Annie; and Robie, David (2015, October). Documentary Practice in the Asia-Pacific. Pacific Journalism Review, 21(2): 217 pages. Aslam, Rukhsana (2015). Media, politics and the threats to journalists in Pakistan. Pacific Journalism Review, 21(1): 178-195. Korauaba, Taberannang (2015). Kiribati in review: Pacific Political Reviews. The Contemporary Pacific, 27(1): 232-237. Robie, David (2015). Cybercrime, criminal libel and the media: From ‘e-martial law’ to the Magna Carta in the Philippines. Pacific Journalism Review, 21(1): 212-230. Robie, David (2015). La’o Hamutuk and Timor-Leste’s development challenges: A case study in human rights and collaborative journalism. Media Asia. (In production). David Robie (2015, November). Rainbow Warrior’s truth-seeking remembered as secrecy lingers. Pen, Sydney. David Robie (2015, July 10). Rainbow Warrior redux: French terrorism in the South Pacific. Pacific Media Centre. David Robie (2015, July 10). Rainbow Warrior redux: French terrorism in the South Pacific. Eyes of Fire: 30 Years On [Online microsite published by Little Island Press]. David Robie (2015, July 10). Rainbow: Warrior: My Eyes of Fire anniversary message. Cafe Pacific. David Robie (2015, July 5). David Robie discusses the Rainbow Warrior with French community radio on Planet FM hosted by Elisabeth Degremont. David Robie (2015, July 4). Double-page spread article by David Robie in the Vanuatu Daily Post weekend. David Robie (2015, July 3). David Robie discusses the Rainbow Warrior with French news agency AFP – Neil Sands. David Robie (2015, June 29). David Robie discusses the Rainbow Warrior with German news agency DPA – Christiane Oelrich. David Robie (2015, June 29). David Robie analyses the Melanesian Spearhead Group decision on West Papua [Southern Cross]. Interviewed by Nick Bond, Radio 95bFM. David Robie (2015, June 28). Fiji, PNG lead betrayal, but West Papua still triumphs. [Cafe Pacific]. Alistar Kata (2015, April 20). Alistar Kata discusses South Pacific Forum issues. [Southern Cross]. Interviewed by Nick Bond, Radio 95bFM. Shailendra Singh (2015, April 17). Nuclear testing legacy haunts Pacific island people. [Interview with PMC’s David Robie]. IDN-InDepth News. David Robie and Alistar Kata (2015, April 13). David Robie and Alistar Kata talk on Pacific issues. [The Wire]. Interviewed by Nick Bond, Radio 95bFM. David Robie (2015, April 11). David Robie discusses West Papua human rights and media issues. [Talanoa]. Interviewed by Marama Papalii, TVNZ Tagata Pasifika. Robie, David (2014, April 24): Don’t Spoil My Beautiful Face: Media, Mayhem and Human Rights in the Pacific. Auckland: Little Island Press in association with the Pacific Media Centre. Bacon, Wendy; Morton, Tom; and Robie, David (2014, May). Investigative journalism trends. Pacific Journalism Review, 20(1): 267 pages. Robie, David; Duffield, Lee (2014, November). ‘Failed’ states and the environment. Pacific Journalism Review, 20(2): 262 pages. Robie, David (2014, December). Pacific Journalism Monograph No 4. Twentieth Anniversary of Pacific Journalism Review Conference Proceedings (69 pages). Korauaba, T. (2014). Kiribati media, science and politics: telling the story of climate change in a ‘disappearing nation’. Pacific Journalism Monograph No 3 (34pp). Auckland: Pacific Media Centre. Robie, David (2014). Pacific Media Watch and protest in Oceania: An investigative free media case study. Pacific Journalism Review, 20(1): 35–60. Robie, David (2014). Lies, media integrity and the new digital environment. Pacific Journalism Review, 20(1): 242-246. Robie, David (2014). Shooting the messenger, Pacific style. Media Development [Canada]. LXI(3); 6-10. Robie, David (2014). Pacific Media Watch: beyond parochial news. Media Asia [Singapore], 41(3): 220-226. Robie, David (2014). ‘Carbon colonialism’: Pacific environmental risk, media credibility and a deliberative perspective. Pacific Journalism Review, 20(2): 59-76. Oosterman, Allison (2014). ‘The silence of the Sphinx’: The delay in organising the media coverage of World War II. Pacific Journalism Review, 20(2): 187-204. Robie, David (2014). Coconet w-fi, digital technology, business and education. Oral -presentation – plenary. Asian Development Bank (ADB), Pacific Business Media Summit, Sydney, Australia. 25-26 March 2014. Robie, David (2014). West Papua: The Pacific’s secret shame: the challenges for Pacific news media. Oral presentation – keynote. Faculty of Law, University of Auckland. 1-2 August 2014. Robie, David, and Abcede, Delia (2014). Cybercrime, criminal libel and the media: from ‘e-martial law’ to the Magna Carta in the Philippines. Pacific Journalism Review Twentieth Anniversary Conference, AUT University, 27-29 November 2014. Aslam, R. (2014). The role of media in conflict: integrating peace journalism in the journalism curriculum. Unpublished doctoral thesis. Ismael, B., and Robie, D. (2014). Written submission for the United Nations Human Rights Council Universal Periodic Review 19th Session by Reporters Without Borders and the Pacific Media Centre on the state of freedom of expression and access to information in Fiji. Paris: Reporters Sans Frontières; Auckland: Pacific Media Centre. David Robie (2014, December 15). Behind the elusive mythmaking over Fiji, West Papua. Pacific Politics [Online publication of the Pacific Institute of Public Policy]. Port Vila, Vanuatu. David Robie (2014, September 28). Fiji elections – freedom and fairness for the media? Interviewed by Colin Peacock, Radio NZ Mediawatch. David Robie (2014, September 27): From Fiji’s dictatorship to ‘democracy’ – the AUT student team on the job. Commentary on The Daily Blog. David Robie (2014, September 24). Punitive media law in Fiji must be repealed. Interviewed by Steve Chase, ABC News Drive. David Robie (2014, September 23). Call for repeal of Fiji’s media decree. Interviewed by Bruce Hill, Radio Australia. Alistar Kata (2014, September 22). Some Fiji media accused of bias over election coverage. Interviewed by Bruce Hill, Radio Australia. David Robie (2014, September 20). A Fiji democratic mandate for the coup leader – what now for the media? Café Pacific, New Zealand. David Robie (2014, September 17). Watchdog hits out a Fiji media. Interviewed by Alex Perrottet, Radio NZ International. Alistar Kata (2014, September 9). Student journalist on the challenges of covering Fiji’s election. Interviewed by Bruce Hill on Radio Australia’s Pacific Beat. Anna Majavu, David Robie (2014, August 28): East Timor court media ruling sparks confusion, triggers global petition – Lasse Underbjerg. Pacific Scoop. David Robie (2014, August 28). Interview on Fiji Return to Democracy seminar, Reporter. Ruci Farrell. Pacific Radio Network. David Robie (2014, August 12). Media freedom in West Papua exposed. Video interview by Struan Purdie, Pacific Media Centre Online. David Robie (2014, June 15): David Robie on human rights in the Pacific – Wallace Chapman. Radio New Zealand’s Sunday. David Robie (2014, June 8): David Robie talks media freedom on Radio Australia – Phil Kafcaloudes . Radio Australia. David Robie (2014, May 29): David Robie talks media freedom to Media Watch – Richard Aedy. Radio Australia’s Media Watch. David Robie (2014, May 3). E-libel laws the new front line in Pacific battle for press freedom. The Conversation. David Robie (2014, April 24): New book focusing on secret history of Pacific – Indira Moala. Radio NZ International. David Robie (2014, January 20): East Timor takes on Australia in ‘rip off’ spy case with country’s future on line. PMC Online Special Reports. Robie, David (2013): Media, Mayhem and Human Rights. Auckland: Little Island Press. (Forthcoming). King, Barry, Johnson, Rosser, and Oosterman, Allison (2013, October). Celebrity and Scandal. Pacific Journalism Review, 19(2): 255 pages. Singh, Shailendra, and Robie, David (2013, May). Media and Democracy in the Pacific. Pacific Journalism Review, 19(1): 309 pages. Drageset, Daniel (2013). Constructing ‘dark’ celebrity: The case of Anders Breivik. Pacific Journalism Review, 19(2): 70-85. Robie, David (2013). Conflict reporting in the South Pacific: A critical reflexive approach to Timor-Leste and West Papua. Media Asia, 40(2): 147-161. Robie, David (2013). Coups, conflicts and human rights: Pacific media paradigms and challenges. Asia Pacific Media Educator, 22(2): 217-229. Robie, David (2013). The talanoa and the tribal paradigm. Reflections on cross-cultural reporting in the Pacific. Australian Journalism Review, 35(1): 43-58. Robie, David (2013). ‘Four World’ news values revisited: A deliberative journalism paradigm for Pacific media. Pacific Journalism Review, 19(1): 84-110. Rahman, Khairiah A. (2013). Life imitating art: Asian romance movies as a social mirror. Pacific Journalism Review, 19(1): 107-121. Robie, David (2013). Fiji, New Zealand, Papua New Guinea, Samoa, Solomon Islands and Tonga media freedom reports. Freedom House Freedom of the Press Report 2013. Robie, David (2013): Pacific media watch and protest in Oceania: A case study of a campus-based free media collective. Protest and the Media conference, University of Westminster, London, United Kingdom, 12-13 June 2013. Robie, David (2013). Deliberative journalism, environmental risk and media credibility. Islands and Nations: ‘Failed states’ and the environment in the Pacific conference. University of the South Pacific, Suva, Fiji, 10-11 July 2013. Robie, David (2013). An Asia-Pacific free media paradigm: Challenging a parochial news ethos in Aotearoa. Asian Media Information and Communication Centre (AMIC) 22nd international conference, Yogyakarta, Indonesia. 4-7 July 2013. Robie, David (2013). Relatoriu media nia liberdade iha Azia Pasifiku liqa ho Timor-Leste. La’o Hamutuk – Timor-Leste Institute of Reconstruction Monitoring and Analysis, Dili, Timor-Leste, 26 November 2013. Robie, David (2013). Foreign reporting challenges in the South Pacific: Advocacy, activist groups and civil society. Danish School of Media and Journalism, Aarhus, Denmark, 23 October 2013. Robie, David (2013). Climate change, conflict and global news: Critical media issues facing Pacific micro states. Institute of Media Studies, Stockholm University, Sweden. 17 October 2013. Robie, David (2013). Foreign reporting challenges in the South Pacific: A Pacific Media Watch free press case study. Institute of Media Studies, Stockholm University, Sweden. 17 October 2013. Yamo, Henry (2013). Mobile phones in rural Papua New Guinea: A transformation in health communication and delivery services in Western Highlands Province. Unpublished MCS thesis in the School of Communication Studies. David Robie (2013, Dec 20). East Timor’s Independente champions genuine ‘free press’. PMC Online Special Reports. David Robie (2013, Nov 25): Read draft media law first, East Timor’s print adviser tells critics. Cafe Pacific ISSN 1562-4315. David Robie (2013, July 28): David Robie talks Rainbow Warrior and the media. Newstalk ZB programme Total Recall. Daniel Drageset (2013). Series of interviews with Radio 95bFM programme on Pacific affairs (Pacific Media Watch project). Prasad, Mohit (2011/2). Dreadlocks literary journal special edition on Creativity and Climate Change in the Pacific. Suva: University of the South Pacific and Pacific Writing Forum; Auckland: Pacific Media Centre. Contributor and associate editor Dr David Robie. Robie, David (2012). Independent journalism in the South Pacific: Two campus-based media case studies in Fiji, New Zealand. Global Media Journal. 6(1): 1-10. Robie, David (2012). ‘Drugs, guns and gangs’: Case studies on Pacific states and how they deploy NZ media regulators. Pacific Journalism Review, 18(1): 105-127. Robie, David (2012). Iconic media environmental images of Oceania: Challenging corporate news for solutions. Dreadlocks, 6/7: 25-49. Robie, David (2012). ‘Four Worlds’ news values revisited: A deliberative journalism paradigm for Pacific media. Paper presented at the Media and Democracy Symposium at the University of the South Pacific, Suva, 5/6 September 2012. Perrottet, Alex (2012). Development journalism and Pacific news values: a case study comparing Vanuatu and New Zealand. Paper presented at the Media and Democracy Symposium at the University of the South Pacific, Suva, 5/6 September 2012. Robie, David (2012). Peace journalism in the South Pacific: A critical reflexive approach to Timor-Leste and West Papua. Asian Media Information and Communication Centre Conference, Shah Alam, Malaysia (Forthcoming, 11-14 July). Aslam, Rukhsana (2012). Entering the realms of investigative journalism: a defence case for peace journalism. Paper presented at the Media and Democracy Symposium at the University of the South Pacific, Suva, 5/6 September 2012. Devere, Heather; and Wilson, Courtney (2012). Peace/conflict journalism in the New Zealand media? Reporting on ‘the Arc of Instability’ in the Pacific. Paper presented at the Media and Democracy Symposium at the University of the South Pacific, Suva, 5/6 September 2012. Josephi, Beate and Robie, David (2012). The visibility of conflicts as ethical necessity: A West Papua case study. Paper presented at the International Association for Media and Communication Research (IAMCR) conference, Durban, South Africa (15-19 July 2012). Perrottet, Alex (2012). Pacific media freedom. World Press Freedom Day event, University of the South Pacific, Suva, Fiji, 3-4 May 2012. Robie, David (2012). Credibility of social media: Trust – should the public believe what they’re told? Presented at the Second Pacific Media Summit, Pacific Harbour, Fiji, 26-30 March 2012. Abplanalp, Karen (2012). ‘Blood money’: A NZ investigative journalism case study. Pacific Journalism Review, 18(1): 128-147. Korauaba, Taberannang (2012). Media and Climate Change in Kiribati: A case study on journalism in a ‘disappearing nation’. Unpublished Master of Communication Studies (MCS) thesis. Auckland: Auckland University of Technology. Deliberative journalism – Article by David Robie, The Fiji Times, 13 September 2012. Pacific investigative journalism study author calls for more collaboration – Interview with Pacific Journalism Review contributor Shailendra Singh, Pacific Media Watch, 30 June 2012. West Papua violence escalating amid media’s ‘silent treatment’ – Interview with Pacific Media Watch’s Alex Perrottet on Radio bFM, 25 June 2012. Kiribati govt must come clean over newspaper investigation – academic – Interview with PMC director Dr David Robie by Radio NZ International, 25 June 2012. Kiribati newspaper closes amid police probe – Inter5View with PMC director Dr David Robie by Radio Australia, 22 June 2012. Pacific Media Centre says Kiribati government rtries to muzzle independent paper – Interview with PMC director Dr David Robie by Radio NZ International, 23 May 2012. Pacific Media Watch praises RNZI for PNG coverage – Interview with Pacific Media Watch’s Alex Perrottet on Radio bFM’ s Southern Cross, 19 April 2012. ‘Peace journalism’ in conflict resolution in the Pacific – Interview with PMC director Dr David Robie by Radio Australia’s Geraldine Coutts, 18 April 2012. Fiji Television on PIMA Pacific summit – Interview on FT’s Close-Up programme with PMC director Dr David Robie, 17 April 2012. Peacemaker Kalafi Moala – Analysis in the Fiji Sun by PMC director Dr David Robie, 9 April 2012. PINA moves on with Moala’s ‘go forward’ plea – Analysis on PACNEWS by PMC director Dr David Robie, 4 April 2012. PINA summit assessed positively by commentator – Interview by Radio NZ INternational with PMC director Dr David Robie, 3 April 2012. Tonga’s Moala calls for Pacific media unity – Analysis on Pacific Islands Report by PMC director Dr David Robie, 2 April 2012. Peacemaker Moala helps bury the hatchet over PINA tensions – Analysis on Cafe Pacific by PMC director Dr David Robie, 2 April 2012. Barnett, S, & O’Rourke, S. (2011). Communication: Organisation and innovation. (3rd ed.). Kuala Lumpur: Pearson. Papoutsaki, E., McManus, M., and Matbob, P. (Eds.) (2010/11). Communication, Culture and Society in Papua New Guinea: Tu tok wanem? Preface by David Robie. Madang: Divine Word University Press; and Auckland: Pacific Media Centre. ISBN 978-1877314-94-3. O’Rourke, S. & Johnson, R. (2011). Internationalising a media studies degree in Arab Higher Education: A case study arising from an agreement between New Zealand and Oman in Sabry, T. (Ed). Arab Cultural Studies, Mapping the Field. London: IB. Tauris. (Publication in November). Robie, D. (2011). The campus and the newsroom: Papua New Guinean media in education profile. In Papoutsaki E, McManus M, Matbob (Eds. ), Communication, Culture and Society in Papua New Guinea: Yu tok wanem? (pp. 186-198). Madang, PNG: Divine Word University. Cass, P. (2011). ‘Teacher! Teacher! I want “A”, teacher’. Pacific Journalism Review, 17(2):130-147. Cass, P. (2011). Fr Francis Mihalic and Wantok niuspepa in Papua New Guinea. Pacific Journalism Review, 17(1): 210-226. Myllylahti, M. and Hope, W. (2011). Global capital and media communication ownership in New Zealand. Pacific Journalism Review, 17(2): 188-209. Perrottet, A., and Robie, D. (2011). Pacific media freedom 2011: A status report. Pacific Journalism Review, 17(2): 148-186. O’Rourke, S. ( 2011). Teaching Journalism in Oman: Reflections after the Arab Spring. Pacific Journalism Review .17 (1) : 109- 129. O’Rourke, S. (2011 ). Curriculum development for Oman 2006 – 2011: Implications for off-shore education and challenges for intercultural communications within New Zealand. New Zealand Communication Journal Special edition: Intercultural Communication. (12)1: 42 – 56. Rankine, Jenny ; Barnes, Angela Moewaka; Borell, Belinda; McCreanor, Timothy; Nairn, Raymond; and Gregory, Amanda. (2011). Suburban Newspapers’ reporting of Māori news. Pacific Journalism Review, 17(2): 50-71. Robie, D. (2011). Conflict reporting in the South Pacific: Why peace journalism has a chance. The Journal of Pacific Studies, 32(2). Robie, D. (2011). Iconic media environmental images of Oceania: Challenging corporate news for solutions. Dreadlocks. v6/7. Incorporating the Proceedings of Oceans, Islands and Skies – Oceanic Conference on Creativity and Climate Change, Suva, Fiji, September 2010. Forthcoming. Aslam, R. (2011). The role of peace journalism in international conflicts. Presented at the New Zealand Political Studies Association Conference, University of Otago, 30 November-2 December 2011. Robie, D. (2011). Independent journalism in the South Pacific: Two campus-based media case studies in Fiji and New Zealand. Presented at the 20th AMIC annual conference: Taking stock of media and communication studies: The challenges and opportunities of globalisation, new media and the rise of Asia, Hyderabad, India, 24-27 June 2011. Robie, D. (2011). ‘Drugs, guns and gangs’ and a growing Pacific state tendency to deploy NZ media regulators to stifle investigative reportage. Presented at the “Back to the source” Investigative journalism conference, University of Technology, Sydney, 16-17 September 2011. Robie, D. (2011). Creative Commons and a Pacific media ‘hub’: A news education model amid crisis, Journalism Education Association of Australia (JEAA) conference in Adelaide, South Australia, 28-30 November 2011. Abplanalp, K. (2011, December). Blood Money, Metro magazine. [Asia-Pacific Journalism postgraduate investigative assignment]. Aslam, R. (2011). Peace journalism: A paradigm shift in traditional media approach. Pacific Journalism Review, 17(1): 119-139. Manning, B. S. (2011). Security intelligence and the public interest: An examination into how keeping security intelligence and classified information secret, and privy only to a state’s executive and aligned operational agencies, affects the function of a modern democracy. An exegesis presented as a companion document attached to the creative component documentary, Behind The Shroud, for a Master of Communication Studies degree at AUT University. Miller, J. (2011). Ngatihine forestry development and the media: A case study. Pacific Journalism Review, 17(1): 175-193. Singh, R. (2011). The 2000 Speight coup in Fiji: An analysis of the role of The Fiji Times and the impact of partisan media. Thesis for a Master of Communication Studies degree at AUT University. Pacific Journalism Review launches new website – Interview with PMC director Dr David Robie by Radio Australia’s Geraldine Coutts, 20 December 2011. Radio NZ’s Mediawatch – Interview with Pacific Media Watch project editor Alex Perrottet by Jeremy Rose, 11 December 2011. Academic condemns lack of NZ coverage of West Papua crisis – Interview with PMC director Dr David Robie in Adelaide, 4 December 2011. New Zealand Herald op-ed article on the British phone-hacking inquiry – Alex Perrottet of Pacific Media Watch, 2 December 2011. Blood Money, investigative article on the Freeport mine in Metro magazine, December 2011 [Asia-Pacific Journalism assignment]. Vanuatu media black spot – interview with PMW’s Alex Perrottet by Radio Australia’s Pacific Beat presenter Geraldene Coutts, 16 November 2011. The Australian’s Media – Interview with PMC director Dr David Robie and profile of Pacific Journalism Review media freedom report, 14 November 2011. Papua a media black spot – article in New Matilda by Alex Perrottet and David Robie, 24 October 2011. Peace journalism researcher warns on turmoil repercussions in Pakistan – Interview with doctoral candidate Rukhsana Aslam by Radio Australia, 24 May 2011. Robie, D. (2010). Pacific reports. In Karlekar, K., Freedom of the Press 2010: A Global Survey of Media Independence. [Pacific Contributor]. New York: Freedom House. Robie, D. (2010). Barbouzes, bullets and beat-ups: South Pacific media realities. In Sun, W. (ed). Media, Policies and Cultures in the Asia-Pacific Region. London: Routledge. Robie, D. (2010). Country reports on Fiji, NZ, Samoa and Tonga. RSF Media Freedom Report Index 2010. Paris: Reporters sans frontieres. Cullen, T. and Callaghan, R. (2010). Reporting HIV in Papua New Guinea: Trends and omissions from 2000 to 2010. Pacific Journalism Review, 16(2): 163-177. Oosterman, A. (2010). New Zealand war correspondence before 1915. Pacific Journalism Review, 16(1): 133-152. Robie, D. (2010). Pacific freedom of the press: Case studies in independent campus-based media models. Pacific Journalism Review, ISSN 1023-9499, 16(2): 99-126. Singh, S. (2010). Life under Decree No. 29 of 2010. Pacific Journalism Review, 16(2): 147-162. Vikilani, S. (2010). Media freedom and state control in Tonga. Pacific Journalism Review, 16(2): 62-80. Aslam, R. (2010). Challenges and dangers in practising effective journalism. Paper presented at the Media, Investigative Journalism and Technology Conference at AUT University, December 4/5. Manning, S. (2010). Political documentary used as a vehicle to communicate a contemporary reality. Paper presented at the Media, Investigative Journalism and Technology Conference at AUT University, December 4/5. Marat, D., Papoutsaki, E., Latu, S, Aumua, L., Talakai, M., Sun, K. (2010). Akoaga – Retention & achievement in the New Zealand tertiary sector: Perspectives of students & parents from Pasifika communities on efficacy, agency & success. Presentation at the 34th Annual Pacific Islands Studies Conference University of Hawaii Celebrating connections: 60 years of Pacific Studies 4-6 November 2010. Marbrook, J. (2010). Cap Bocage: exploring concepts of legitimacy and militancy in local environmental protest in New Caledonia. Paper presented at the Media, Investigative Journalism and Technology Conference at AUT University, December 4/5. Miller, J., and Peters, G. (2010). Seeing the wood for the trees: media coverage of the 1970s Ngatihine Forestry Block – a case study. Paper presented at the Media, Investigative Journalism and Technology Conference at AUT University, December 4/5. Robie, D. (2010). Pacific freedom of the press: Case studies in campus-based media models. Keynote paper presented as UNESCO World Press Freedom Day University of Queensland Lecture Series, University of Queensland, April 30. Robie, D. (2010). Censorship and the legacy of independent campus-based publishers in Oceania. Paper presented at the Journalism Education Association of Australia (JEAA) conference at the University of Technology, Sydney, November 24. Singh, T. R. (2010). The 2000 Speight coup in Fiji: An analysis of the role of The Fiji Times and the impact of partisan media. Paper presented at the Journalism Education Association of Australia (JEAA) conference at the University of Technology, Sydney, November 24. [Winner of the JEAA Pacific Scholarship]. Singh, T. R. (2010). Coup culture in Fiji: An analysis 1987 to 2006 from an investigative journalism perspective. Paper presented at the Media, Investigative Journalism and Technology (2010) conference at AUT University, 4/5 December 2010. Thomas, V., Papoutsaki, E., Eggins, J. (2010). Visual Dialogues, Community Action & Social Change: a South Pacific Islands HIV/AIDS project application. AMIC 19th Annual Conference Technology and Culture: Communication Connectors and Dividers, 21-23 June 2010. Thomas, V., Mel, M., Papoutsaki, E.. (2010). Exploring local methodologies through creative collaborations with Pacific communities. AAAPS 3rd annual conference, Oceanic Transformations. Melbourne: Victoria University, Melbourne, 8-11 April 2010. Robie, D. (2010, April 10). Fiji media decree draconian and punitive. PMC Online. Robie, (2010, October/November). The darker side of paradise. The Walkley Magazine. PANPA Bulletin (2010, March) – Fiji to issue new media decree. Interview with David Robie on media censorship in Fiji. TVNZ (2010, April 13). Barbara Dreaver interview with David Robie about the Fiji Media Industry Development Decree. 95bFM (2010, April 13). Will Pollard interview with David Robie on the Fiji Media Industry Decree. Radio NZ Mediawatch (2010, April 18). Jeremy Rose interview with David Robie on Media Fiji Media Industry Development Decree. Radio NZ Mediawatch (2010, October 3). Fiji’s oldest newspaper under new management. [Interview with David Robie]. Radio NZ Mediawatch (2010, December 6). Colin Peacock interviews Kunda Dixit on investigative journalism. [MIJT 2010 Conference at AUT].